With summer well and truly here, the summer garden is also established and in full bloom. The early flowering perennials are going over and we start to look forward to the later flowering varieties to take the garden into late summer and the beginnings of autumn. One plant has looked particularly good this year probably due to the very hot weather we had in late spring. This plant has been in our gardens for ages. 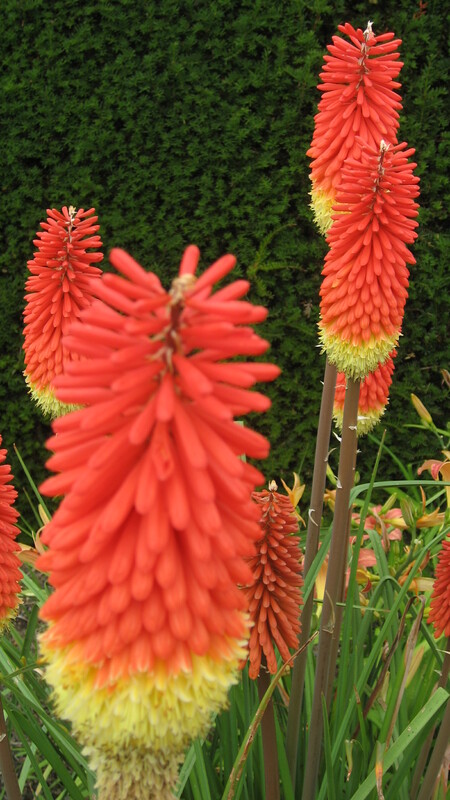 Although a key plant in the late Victorian borders, it became out of fashion around the Seventies and Eighties but is now making a comeback. 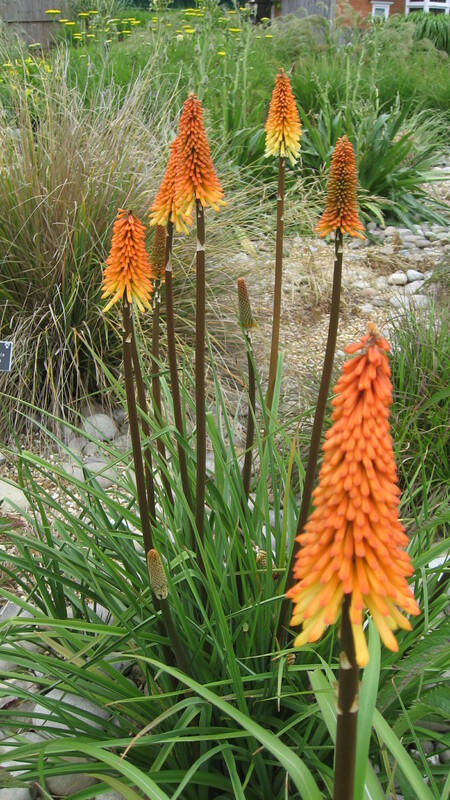 That is the Kniphofia, commonly known as the Torch Lily or Red Hot Poker. They were disliked for their unattractive leaves and somewhat garish colours when one of the most commonly grown cultivars was ‘Royal Standard’, the tall tricoloured variety. Launched in 1921. Left to their own devices, they spread to create an untidy mass that due to their strong colour and size, over dominate the herbaceous bed. However, placed well and controlled, this variety and its fellow cultivars look stunning. There are few of the older varieties that you could say fall into the subtle category but the newer varieties do have more subtle colours and a narrower less course leaf. 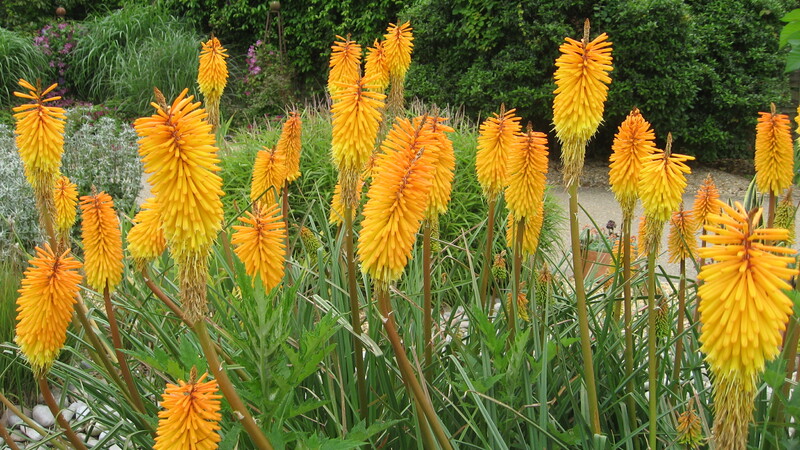 They are a great plant for bright and hot fiery beds. In addition, these days the colour range is far greater spanning pale creams and greens through all shades of yellow and orange to deep reds and apricots. The stunning orange of ‘Shining Sceptre’ is very dramatic when combined with purple perennials and softened with white flowers. Similar in colour although slightly more diminutive is ‘Bees Sunset’, which is stunning on its own but if planted by a pond creates a superb contrast and reflection. These plants are also very effective if planted in front of bronze or purple leafed shrubs such as Cotignus ‘Palace Purple’ or the beautiful Cercis canadensis. Careful plant combinations can control the impact of the strong colours. For example, the all yellow variety ‘Wrexham Buttercup’ or ‘Sunningdale Yellow’ look really good against other yellow flowers or cream variegated leafed plants such as Cornus contraversa ‘Variegata’. These dilute the strength of the intense yellow. 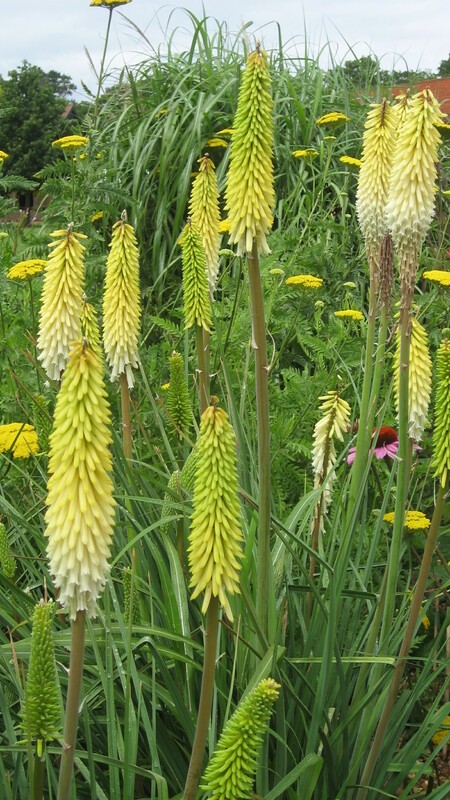 The other characteristic of Kniphofia that gives it such a strong presence in the garden is of course the vertical nature of the stems and blooms. 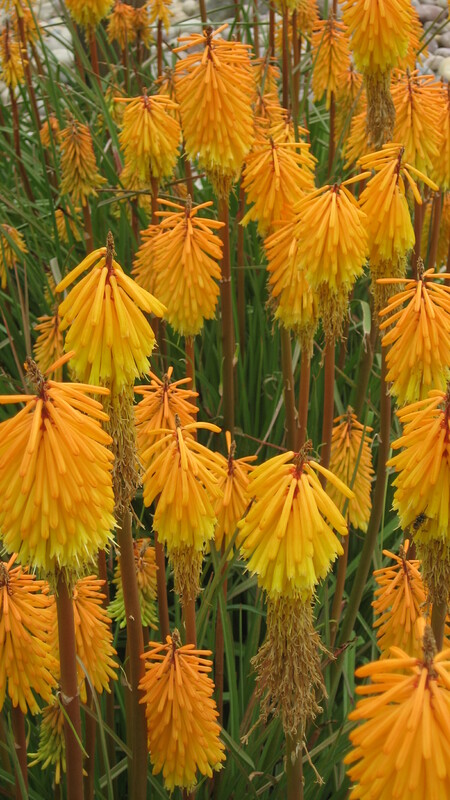 A great plant combination is orange Kniphofia planted alongside a yellow Achillea such as ‘Coronation Gold’ with its flat cloud like flowers. The shapes complement each other well creating great interest . ‘Tawny King’ is a good example of a softer orange variety that would work well in such a combination. 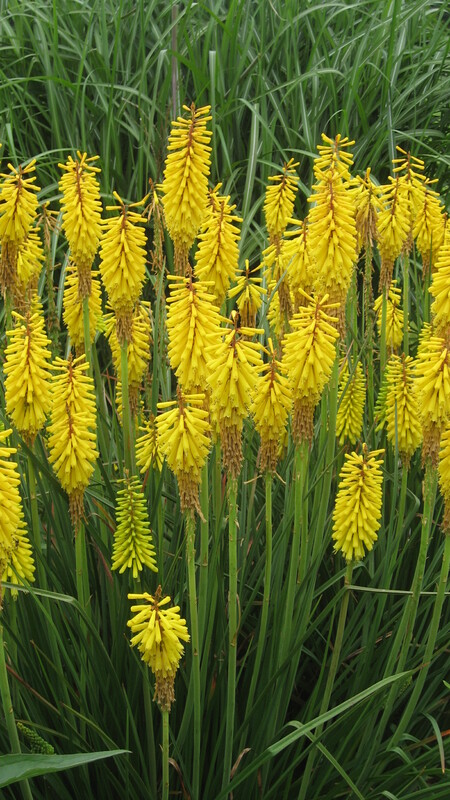 Of recent years, grasses have become incredibly popular in this country and this invites another excellent combination with the Kniphofia stems growing though soft Miscanthus grasses. I also like to plant the red varieties with Rudbeckia for a late summer explosion of colour. The effect of the strong yellow daisies with the scarlet spikes is most pleasing. In addition to the above seek out the green varieties such as ‘Ice Queen; Maid of Orleans; Green Jade’ or the diminutive ‘Little Maid’ all which look stunning against a dark green screen. For apricots and scarlets, look for ‘Samuel’s Sensation’ ; ‘Lord Roberts’ and the beautiful French variety ‘Erecta’ which has been around since the beginning of the 1900’s but still looks wonderful over 100 years on. I hope you agree that these venerable plants deserve to be enjoyed in our gardens again and planted wisely bring excitement and beauty to our gardens.